In the fast and shallow anxiety around driverless cars, there isn’t a lot of attention being paid to what driving in cities itself will become, and not just for drivers (of any kind of car) but also for pedestrians, governments, regulators and the law. This post is about the ‘relative geographies’ being produced by driverless cars, drones and big data technologies. Another way to think about this may be: what is the city when it is made for autonomous vehicles with artificial intelligence? The question of planning cities in response to automobiles is not a new one. It was addressed through a number of architectural and urban planning visions in the 1920s-50s. 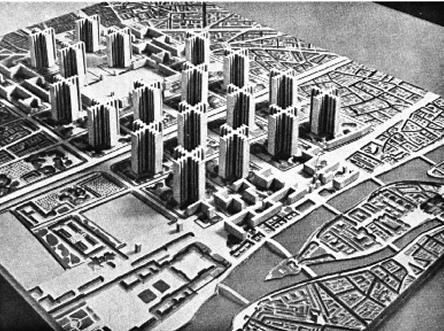 Two of the most significant are Le Corbusier’s La Ville Radieuse (‘The Radiant City’), and the Plan Voisin/ Ville Contemporaine (Voisin was the car company that bankrolled this plan) for Paris. The former was never achieved, and the latter was more developed but also left incomplete. Corbusier’s Plan Voisin was founded on the belief that the centre of Paris was congested, dirty, and unable to support the deluge of motor cars of the early twentieth century. Plan Voisin/Ville Contemporaine would have involved uprooting and razing most of central Paris from Gare de l’est to Rue de Rivoli, and from Place de la Republique to Rue du Louvre. Le Corbusier’s solution, Ted Shelton writes here, “was to eliminate the infrastructure of the Parisian street and replace it with spaces designed around the car. In the Plan Voisin the traditional city must yield to the infrastructure of the automobile wherever the two were in conflict.” (in Automobile Utopias and Traditional Urban Infrastructure: Visions of the Coming Conflict, 1925–1940). Other models for cities imagined around technology, particularly cars, are The Metropolis of Tomorrow (Hugh Ferris, 1929), Broadacre City (Frank Lloyd Wright, 1932), and Futurama (Norman Bel Geddes, 1939–40). Each of these proposals attempted to reconcile the “the ever-increasing speed and large-scale geometries of the automobile and the much finer grain and slower speeds of the traditional city street.” (Shelton, above, again). In detailing vertical and horizontal planes of movement of people and traffic, the spread of buildings, the fates of city centres, and travel between airports and cities, automobile technology sets the direction for optimistic, Utopian, urban planning and architecture. Like the twentieth century automobile, the driverless car will re-order relationships to urban space and produce new kinds of places and urban cultures. The parking lot, rendered as cold, dangerous and creepy in cinema, is one such place. Commercial and personal use drones will need their own parking spaces, perhaps like the new Norman Foster droneport in Rwanda. The first pizza delivery by drone in New Zealand raises all kinds of practical questions about how exactly you’d get your pizza if you lived in an apartment building. Would the drone hover outside your window (what if you don’t have a balcony?) or leave it in a drone delivery depot? The devil is in the detail. Liam Young’s forthcoming film, In the Robot Skies: A Drone Love Story, is a film shot by pre-programmed autonomous drones and tells the near-future story of two young lovers in a London Council Estate sequestered in their homes under ‘anti social behaviour orders’ who communicate by hijacking local CCTV camera drones that surveil their estate. Young says that just as the New York subway car of the 1980s birthed “a youth culture of wild style graffiti and hip hop”, the drone will create particular networks and cultures of surveillance activists and drone hackers. Not only is this a drone’s eye view of the city, but drones will be able to create film locations that weren’t accessible before. But while droneports and Council Estate drones may produce new flows of people and urban subcultures, big data technologies also continue to play a role in shaping and re-instating pre-existing physical geographies. Nowhere is this more poignant and difficult than at borders. Josh Begley’s new film Best of Luck With the Wall, is 200,000 satellite images of the US Mexico border on Google Maps. In making the film, Begley says he wants to focus on the physical geography and the inhabitants of it: “The southern border is a space that has been almost entirely reduced to metaphor. It is not even a geography. Part of my intention with this film is to insist on that geography.” He does, but in doing so is also pointing upwards to the very satellites that made the film possible, the vast human, legal and machine apparatus that produces and maintains the US-Mexico border. So this border, and any border at this point, is both a physical geography, as well as something produced by technologies of border surveillance that deliver certain kinds of knowledge about what is valid, legal and legitimate in terms of movement across it; and what is not. The surveillance apparatus of the US Mexico border is also comprised of people who work to make sense of data collected by machines. Joana Moll’s and Cedric Parizot’s The Virtual Watchers is a project that reveals another side of crowdsourced, open source intelligence. Moll says that Virtual Watchers is based on a project that was launched in 2008, and consists of an online platform called RedServants, a network of 200 cameras and sensors. The 203.633 volunteers on Red Servant watched camera feeds of the US Mexico border and identified “illegal” border crossings and other “illegal” events. Norman Bel Geddes’ Futurama was where cars would create the “grain” against which the city would be built; now, with the gradual accretion of sensors, radar, lidar, optical recognition, fingerprint scanners, biometric turnstiles, key-card only access zones, license plate scanners, cameras, recorders, databases, dashboards, and maps, it is as if big data is the grain against which place itself is imagined. Smart city visions are based on visions of second-order cybernetic actualization. Orit Halpern’s work analyses the evolutionary arc of urban design imaginaries in smart cities like Songdo in South Korea, Masdar in Abu Dhabi, and Singapore. In these cities architecture and urban planning become armatures, or interfaces, for control through a kind of higher-order knowledge assumed to be embedded in data. AUDI – (DRIVER)LESS IS MORE from BIG on Vimeo. But before we arrive at that point where everything is re-adjusted for the driverless car, there is going to be considerable struggle for political rights and freedoms against the blindness of algorithms based on already-biased databases. For example, as Seda Gurses recently said, would we rediscover racial discrimination in apps like the way-finding app, Waze, or Redzone, that “help” stay out of “high crime neighbourhoods”? What kind of new places will be created, and discriminations perpetuated, by autonomous driving that identify people and neighbourhoods as criminal or threatening? As unacceptable as this is, it is these moments of the messy glory of human difference that must be fashioned into speedbumps, in-computable objects, on the road to Utopia.